Summary : This white tea is essentially a coconut tea. If coconuts are your thing, you'll love this tea. If you are searching for a more "tropical flavor" or the more traditional flavor of white tea, you won't find it here, so keep searching. Review : Wow, it's been nearly two weeks since I wrote up a tea review. Well, I do have an excuse...I've been busy working on some other websites I have. And from time to time, I simply get into a "fixture mode" where I drink my favorite teas, thus losing my mood for experimentation. Thankfully, that mood broke tonight, and I found myself yearning for a white tea. So I dug through my tea samplers and the first white tea to show itself was the White Tropics tea from Adagio Teas. This is how Adagio Teas describes their White Tropics Tea on their website : "Premium white tea from Fujian region of China marrying the tropical flavors of pineapple and coconut. A wonderfully smooth and subtle treat, delectable both hot and cold. 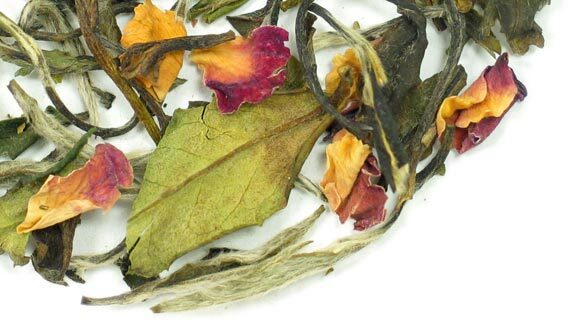 If you're new to white tea, this would be a good place to start." Pineapple? Coconut? Hmm...sounds kind of tasty, especially here in December, with summer many, many months away. I popped the lid on the nice little container Adagio always packs their teas in and was sort of inspired by the fragrance. While the leaves didn't have a "tropic aroma" right out of the tin, it wasn't bad either. However, lucky me, that changes completely once you add the hot water (not boiling!). As soon as hot water is added to the leaves, you are greeted by a moderate aroma of pineapple and coconut. Always a good sign for a tea that is supposed to have the flavor of pineapple and coconut. My first sip of this tea was, admittedly, a bit disappointing. I had to think a minute for what this tea's flavor actually was. But soon the full flavor hits you. Essentially, what this tea is is a STRONG coconut flavored White Tea. The flavor of pineapple is like nowhere to be found, either because there wasn't enough of it in the tea or simply because the coconut flavor is so strong that it "covers up" the pineapple flavor. Admittedly, coconut isn't my favorite thing in the world. How Tom Hanks survived on only coconuts in the movie Castaway I'll never know, and would prefer to never find out. Because of this, I was less than thrilled with this tea. Indeed, the coconut flavor of this tea is so strong that it also drowns out the light, somewhat sweet flavor you usually find in a white tea. Overall, if you are searching for a sweet white tea or a traditional white tea, this tea isn't for you. Likewise, pineapple lovers will be disappointed. But, if you are known as a coconut lover, well then, get this tea...as it has your name on it. Recommendation : Sort of. Whether or not you'll like this tea depends on what you are looking for. At the core, this tea is a Coconut Tea. Yes, it has white tea leaves and pineapple flavoring has been infused...but you will taste neither, mainly due to the fact that the coconut flavor is so strong. Thus, if you like coconuts, this tea is for you. But if you are searching for a more tropical type tea, move on to something else, as this tea will likely disappoint. Brewing Instructions : Use 1 teaspoon of leaves, although you'll need to use a bit more due to the large size of the leaves. Pour water with a temperature of 180 degrees over leaves and let brew for 7 minutes.